Temperance Releases Video for "Of Jupiter And Moons"
Melodic metallers Temperance have released a video of the song "Of Jupiter And Moons", the title track of their new album, which will be released on April 20th 2018 on Scarlet Records. 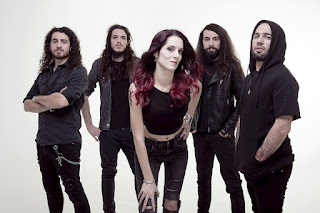 The video features the new line-up of the band, now a 5-piece with the addition of singers Michele Guaitoli (Overtures, Kaledon) and Alessia Scolletti. Check the video here: https://youtu.be/TDWOifwGpKY.